Grace Healey finds herself adrift. World War II is over, her husband is dead, and she is unsure what to do next. As she walks through Grand Central Station, she happens to see a suitcase hidden under a bench. When she opens it, she finds photos of female operatives and decides to find out what happened to these women. A few years earlier, Eleanor Tigg was given the task of finding and training women who would be dropped into Nazi-occupied nations as spies. One of those women was Marie Roux, who was delivered to France to work under an enigmatic spymaster and send back information via radio. I have a weakness for World War II stories. I just can't resist reading another when I see it offered for review or sitting on my library's shelves. 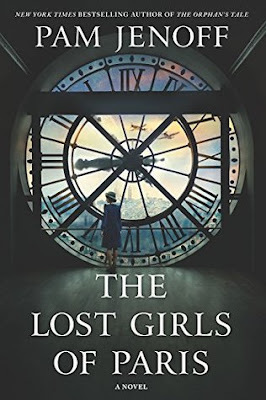 But I often find myself disappointed and unfortunately, The Lost Girls of Paris did not work for me. The story follows Grace, Eleanor, and Marie, but none of the characters had much depth. Historically, the Allied military was very reluctant to utilize women as operatives, but if this story was any indication, they might have been right to be concerned. Marie does so terribly in spy school that it is difficult to fathom why she was sent into the field. Once she is actually in France, she disobeys orders and often makes terrible choices that put her and her colleagues at risk. The wonderful thing about historical fiction is that most authors write multiple books set in the same era. While I didn't love this story, Pam Jenoff is beloved by many readers. If you enjoyed her books The Kommandant's Girl or The Orphan's Tale, you might enjoy The Lost Girls of Paris too. Sorry this one wasn't better.